Last year I mentioned lots of ways to create posters online in Online Poster Makers. Do take a look at that article, because there’s crossover here with some of those editors mentioned that are also useful to make picture quotes. Basically, the biggest difference I see between the two is that poster makers may include quote makers i.e. the poster may only be an image with a quote on it. 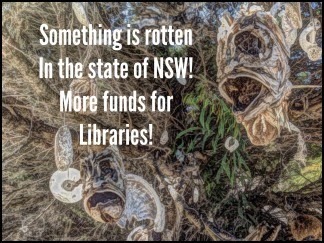 But a picture quote maker usually doesn’t have all the options a good poster maker has. While I find picture quote makers useful as a blogger, perhaps as a way to highlight certain text and provide a pinnable image, I think they’re also useful in an educational setting. 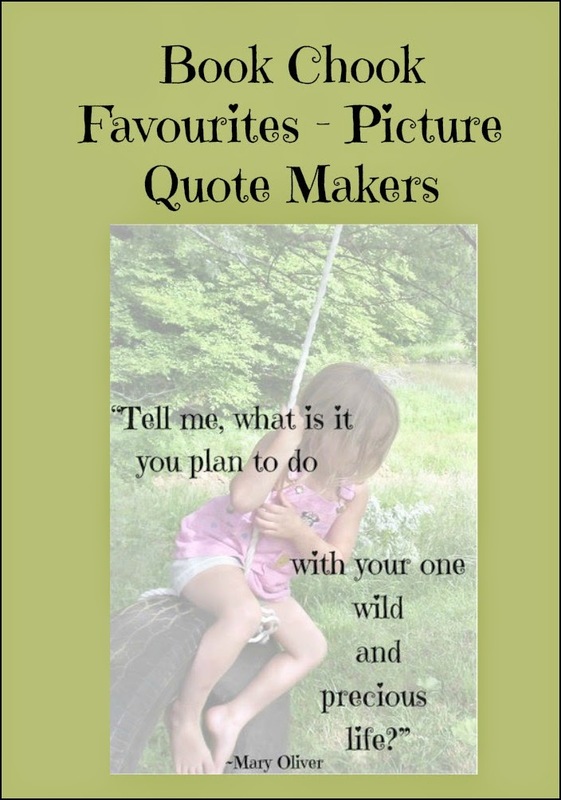 We need to encourage our children to look for ways to create images, so as to avoid licensing problems, and picture quotes are a quick and easy way to do that. Particularly if students blog themselves, picture quote makers make yet another way to visually communicate with an audience. Picture quotes are very popular on social media sites, with people collecting them on Pinterest, and publishing them on Facebook, Twitter etc. I love the idea of children thinking about their own values and beliefs and searching for inspirational quotes that resonate with them, or perhaps of creating their own “quotes” for others to share. Below you'll find my favourite ways to produce a visual quote, both online and with an iPad app. Quozio is one I mentioned in Online Poster Makers. 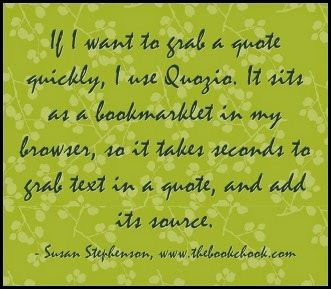 If I want to grab a quote quickly, I use Quozio. It sits as a bookmarklet in my browser, so it takes seconds to grab text in a quote, and add its source. Quozio presents me with options for backgrounds for that text. Alternatively, I could go to the website and enter my quote, and source. Quozio presents you with around 30 backgrounds, and their accompanying fonts, that you scroll through until you find the one you want. You need to register if you want Quozio to save the quotes you make, but you can easily save to your computer. You can’t customise backgrounds, size or fonts. It does what it does simply and well, and is free. Main advantage: free, fast, has bookmarklet. Disadvantage: limited number of backgrounds, no customisation. 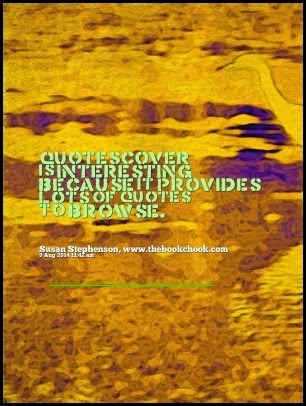 QuotesCover is interesting because it provides lots of quotes to browse or you can enter your own wording. It then presents you with different formats e.g. Twitter Header, Twitter status update, high res business cards etc, and there are further choices inside. Once the quote is rendered, you can tweak again, with lots of options available, colours, fonts etc, but you need to click through them - next, next, next - rather than choosing a particular one by its name from a menu. You can draw on the quote too, and you can also insert a picture of your own to use as background. It’s a slower process than Quozio because of all the options. It’s free and no need to log in unless you want to publish to Facebook - I think. You seem to be able to save unlimited quotes to your computer. Main advantage: free, some customizing. Disadvantage: no way to choose a particular font or colour, takes time. My favourite way to illustrate quotes is via PicMonkey and/or Canva. I mentioned them both in Favourite Online Image Editors (Updated). I really like being able to choose the exact size and shape of my background image. 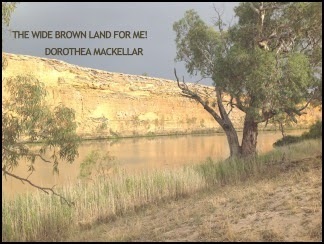 I used PicMonkey to illustrated the Mary Oliver quote at top. Users can upload an image and fade/reduce transparency, then add the quote as text. Sometimes I use photos I’ve taken; at others, I source images at a site like Morguefile which doesn’t require attribution. It certainly spoils the look of an attractive image to have to add a detailed url to it. It’s also easy, instead of starting with your own image or someone else's, to choose a background offered by the sites themselves. The process of visually reproducing a quote is not as simple as using a website like Quozio, with it’s handy bookmarklet in your browser, but I think the results are much more elegant. It’s enjoyable to create an image and apply a font that matches the theme of your quote too. We should let kids share the fun of creating! Main advantages; original, very customisable, great way to develop some visual literacy skills. Disadvantage: takes longer. Imagination Box is an app I reviewed earlier this year. 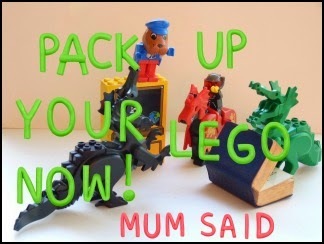 When we’re working with younger children, a quote may very well be something Mum or Dad said. An app like Imagination Box helps kids compose and picture such a quote. Over is a great app for typing over an image. It also offers words in special fonts and limited free art work, with the option of purchasing more. Lots of sharing options too. Older kids will enjoy decorating their chosen quotes with Over. 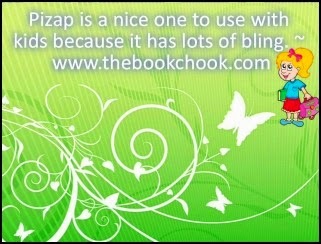 Pizap is a nice image editing app to use with younger kids because it has lots of bling. I like the fact you can start with one of their backgrounds and add clipart, text etc, meaning you don’t even have to import an image. It doesn’t satisfy that side of me that likes “elegant” but I doubt kids will agree. It's also an online editor. Type Drawing is an interesting app because it allows users to make curving and straight text pathways. Once you input the text you want, and choose your image, you draw on your screen with your finger and the text follows that curved path, or set it to straight. You can have the path set to continuous, or not allow it to repeat, plus choose font, colour etc. You can also change the opacity of an image. Find your favourite quote about reading and work out a way to represent it as an image. Consider things like how to best represent what you think the quote means, or why it’s important. You could paint a picture, and write the quote over it when it’s dry. Or you could use digital tools to create it with. Think about taking a photo that would add to the quote’s meaning, or give it context, and then fading that image a little so you can type over it. 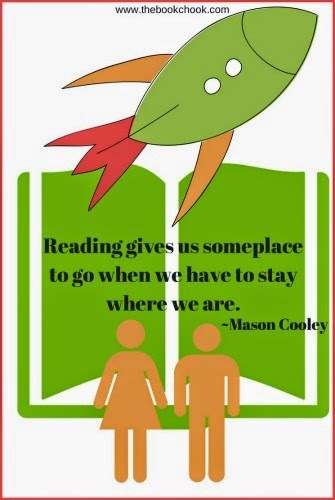 To make a background pic for this quote by Mason Cooley: “Reading gives us someplace to go when we have to stay where we are.”, I thought about how reading can take us to other worlds. I imagined a space ship bursting from the pages of a book. I went to Canva and chose a canvas size for my image. Then I looked in icons for a space travel image, a book, and some people shapes. I arranged them the way I liked, changed the people colour to match, and added my quote as text, plus the name of the person who originally said it.